to those who follow the Islamic faith. There is an area of several miles around Mecca that is considered to be haram (restricted), and non-Muslims are forbidden to enter this sacred zone. Those Muslims who travel into this area as they progress toward the Mother of Cities must profess their having undergone a state of ritual purity and consecration. It is at this point that they set aside the clothes in which they have traveled and don a special article of clothing consisting of two seamless white sheets. The hajj begins with a procession called the tawaf, which takes the pilgrim around the Ka'aba seven times. 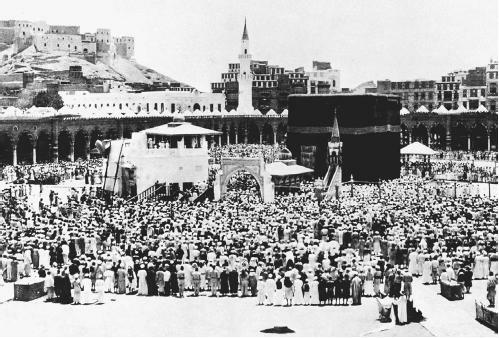 The Ka'aba is a cube-shaped structure that stands about 43 feet high, with regular sides from 36 to 43 feet. The building is draped in a black cloth (kiswah) that bears a band of sacred verses embroidered in gold and silver thread. In the southeastern corner of the Ka'aba is the sacred Black Stone, an ancient holy relic about 11 inches wide and 15 inches high that has been mounted in silver. Muslims believe that Allah sent the Black Stone from heaven. It is the fortunate pilgrim who manages to break free from the press of the crowd and kiss the Black Stone. Because of the great mass of humanity crowding into the Ka'aba at any given moment, it had been decreed centuries ago that the gesture of a kiss toward the stone will suffice and merit a great blessing.